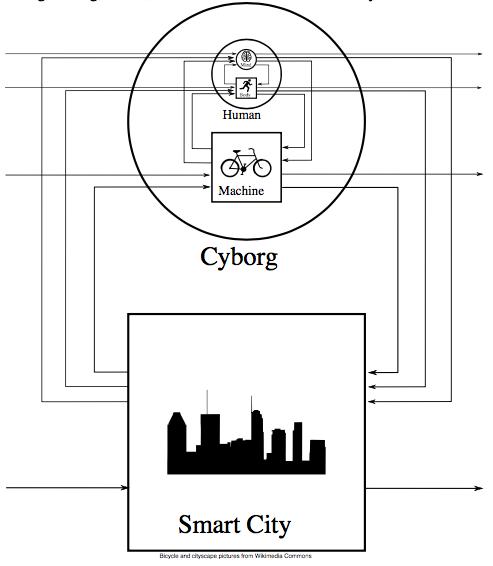 architecture-of-one, and thus cyborg technology is urban design"
-- Steve Mann, MIT Architecture, 1992. In a world of Big Data centralization, we also need distributed “Little Data” like blockchain. “Wearables”, blockchain, and sousveillance are necessary to prevent fake news and stop corrupt surveillance. The fundamental question humanity faces is one of having the right AND obligation to understand and document how machine intelligence is changing us. That process is not solely driven by police surveillance, but also includes a plethora of tracking activities across the social graph. We must try to affect positive change, given the tsunami of powerful technologies available to disrupt our lives — for both good and evil. The answers–if they exist at all–are answers to wicked problems where the boundary conditions are not very well understood. 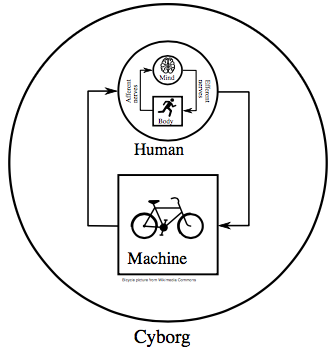 We shall begin with an attempt to humanise the discussion, beginning with a mind/body duality as a foundation for a cybernetic connection to the world’s ever more complex systems. We attempt to bridge the key issue to how we humans innately adapt systems to our use, then expand and generalize this analogy. 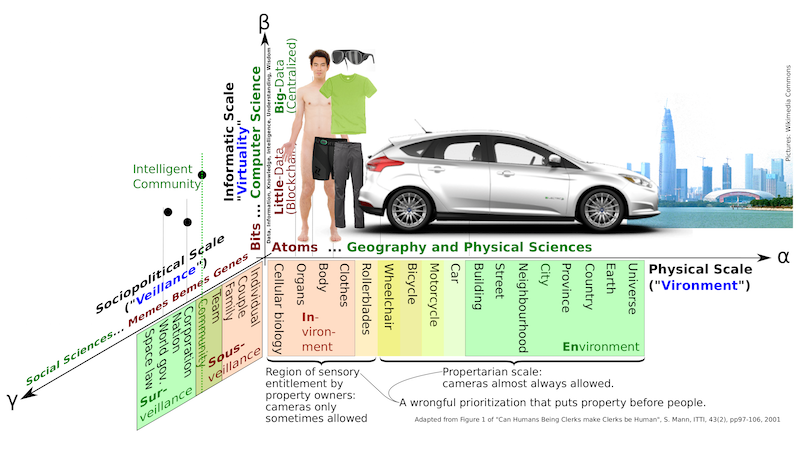 Other technologies like the automobile respond to us to even greater degrees. Just a very light touch on the accelerator and the automobile responds greatly to that small input from us. And today cars are starting to be equipped with cameras and other sensors that recognize us and our minute gestures. Soon cars will even tell when we’re feeling a little tired, or if we’ve had too much to drink. Some cars keep track of where we go, and even give the police and insurance companies a recording of our speed and acceleration and driving history. In this sense, cars are becoming “surveillant systems”, ie. systems that sense us and possibly report us to other authorities. When our bicycle breaks down, we can understand it and fix it, but modern cars are a mystery to the average driver. The car knows a lot about us, but often reveals very little about itself. Not everyone can, or event wants to, understand everything about how the world works, but it is in society’s best interest if at least some members of the society can understand how things work, beyond the companies that make them. When the manufacturer of a technology is the only entity that can understand it, there is an inherent conflict-of-interest, and an information asymmetry. 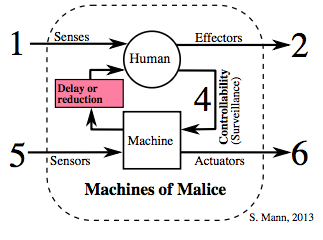 And when machines reveal their internal state, they can be trusted more. Much of the world we live in is being interconnected with technologies that are surveillant and centralized in nature, but this information flow is often one-sided. 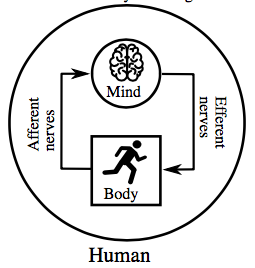 The information assymetry is like a body that has only (or primarily) a working afferent nervous system, but a broken efferent nervous system. In today’s society, we are all potential news reporters. We all have a right (and sometimes even a moral or ethical obligation) to tell our story. Whether a friend or a courtroom asks “where were you last night?” we have a right to, if we wish to, show where we were or were not. We might wish to prove we were not at the scene of a crime. Or we might wish to be able to prove we have done nothing wrong. When those with the authority of surveillance try to prevent sousveillance, we have a potential conflict-of-interest, and thus it is in the public interest to have multiple independent news sources that tell us what happened. When a North Carolina officer threatened a motorist for recording himself (and the officer), social pressures rightly upheld the rights of the individual to tell his story [North Carolina officer demoted after telling Uber driver/lawyer he couldn’t record police, abc7NY WABC-TV, Monday, April 03, 2017]. 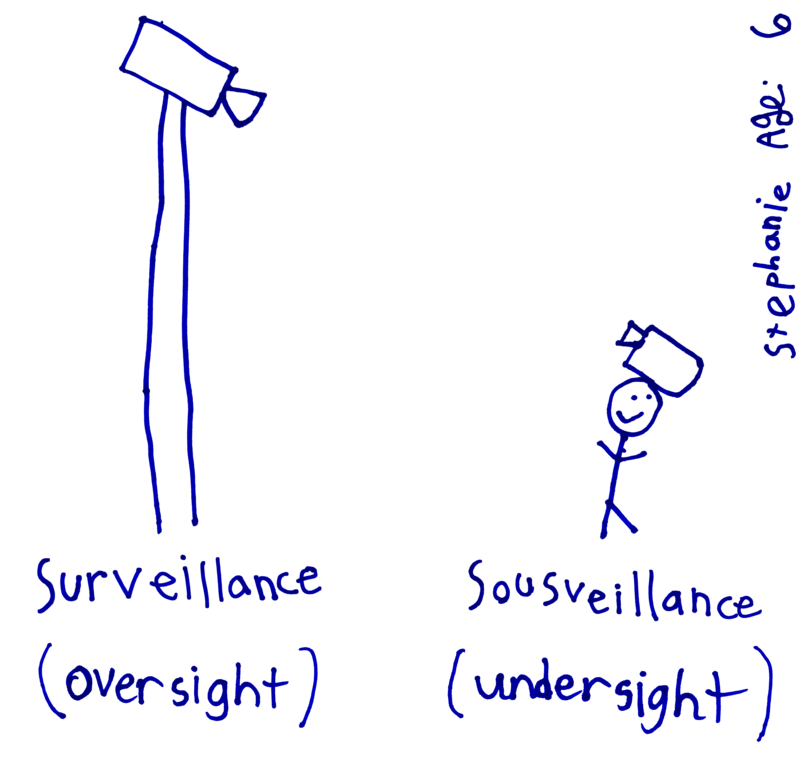 There is an inherent hypocrisy in “Big Data” and surveillance (“Big Watching”) that tries to suppress “little data” and sousveillance (“little watching”). And the opposite of hypocrisy is integrity. Thus big data and surveillance often embody or sustain a lack of integrity. This lack of integrity can be mitigated through the introduction of distributed (little data) technologies like blockchain and sousveillance. 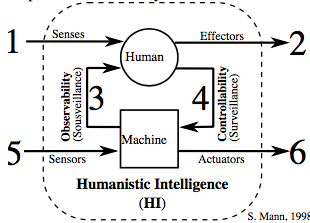 “Smart Clothing: The Wearable Computer and WearCam”, Steve Mann, Personal Technologies, Springer, March 1997, Volume 1, Issue 1. With the rise of AI (Artificial Intelligence), more and more it is machines that are doing the watching, rather than people. Thus the question will no longer merely be whether or not we have the right to record the police, but increasingly, whether or not we have the right (and responsibility) to record (and understand) machines and machine intelligence. Additionally, the human and machine both sense and affect their surroundings, so there are actually a total of six signal flow paths. 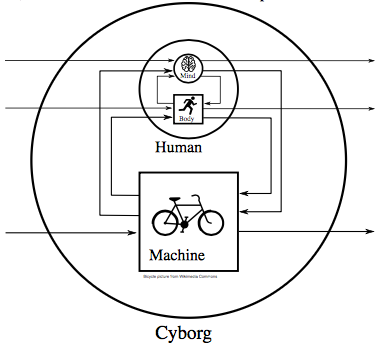 But the most important ones for our discussion are those that form the feedback loop between human and machine. Privacy with surveillance is like the Panopticon prison, in which prisoners’ privacy is protected by isolating them from one another, while all remain visible to the guards. This is not true privacy. 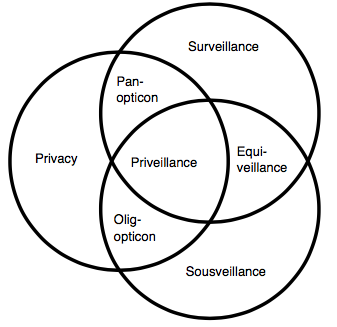 Equiveillance is the equilibrium between surveillance and sousveillance, thus forming a foundation for priveillance (central equilibrium point in the diagram). The idea here is to fight fake or biased news by transmitting raw unfiltered news as-it-happens, in realtime, so there is no time or opportunity to “spin” or bias or falsify the news. News reports are cryptographically timestamped and widely distributed. NEWStampTM system for fighting fake news. 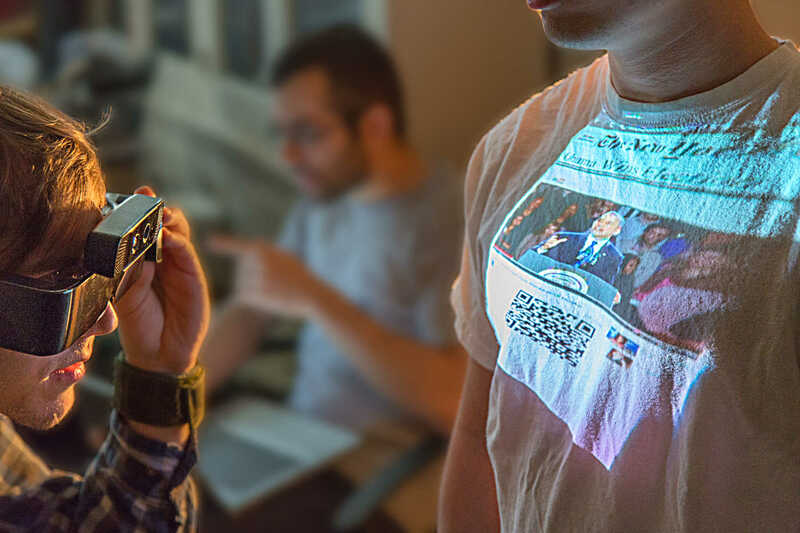 News such as New York Times front page, is projected onto the real world by way of a wearable data projector, and then forms part of the captured live video of other newsworthy activity from day-to-day life. The NEWStamp prototype ENGwear system consists of a wearable newsgathering camera combined with a wearable newsputting projector. Although “Big Data”, Surveillance, and Environmentalism (“Big Space”) are important, they must be balanced with “Little Data” (e.g. blockchain), Sousveillance (i.e. “Little Watching”) and Invironmentalism (“Little Space”, e.g. “wearables”). The combination of wearables, blockchain, and sousveillance is essential to combatting fake news. In the future, we hope that none of us are prevented from telling the truth, and from collecting the data that we need in order to tell our story, using the technology of the day. There is much work to be done. For example, how would we build a service out of the process of time-stamping and inverse time-stamping to address fake news? Additionally, when it is so difficult to get real news, fake news can flourish in this partial vacuum. As the news industry dies, there is a last gasp of panic as so many of the news sources disappear behind paywalls or registration. When real news is no longer freely accessible (or becomes less accessible), fake news has more room to prosper. We’ve reached a time when a web search returns results that look promising but fail to show what we searched for. What we need is a search engine that pre-checks to make sure the thing we’re looking for is actually in the link. Imagine a search engine that takes you right to the place in a document that contains the term you searched for. Sousveillance as a social contract requires a counterpart to security. Suicurity (self care) is to security as sousveillance is to surveillance. What the world needs as not privacy, but, rather, priveillance. We’re entering a world where every streetlight has at least one camera hidden inside it, to track traffic flow and lead us toward zero traffic fatalities. It is as futile to try to stop this surveillance as it is to try to stop a blind person from wearing a camera to see properly. So instead of trying to restrict surveillance, what we need to do is turn it into veillance. Taking the politics out of smart cities simply means making the data available to everyone rather than a select few. 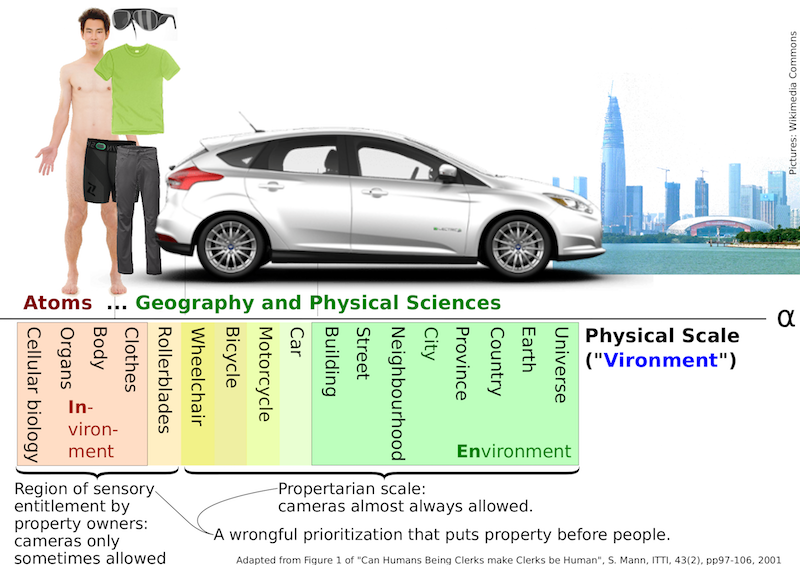 Where Google’s smart city (“Gooveillance“) in Toronto failed, a more priveillant smart city will prosper (starting with a pilot to install a few hundred smart city streetlight camera nodes in the downtown core, under principles of priveillance rather than “Gooveillance”). The other important idea is the notion that we should regard surveillance as creating a spoliation of evidence whenever sousveillance is prohibited or not provided. Thus it ought to be a requirement that the data be open (i.e. that it be priveillant) if it is to have the potential to be used against us. We need an app like “Vericop” to create MAI (Mutually Assured Identification), so that officials who request our identification (“show your papers!”) be identified. Insanity, it is often said, is “doing the same thing over and over again and expecting a different result”. Yet that’s basically what we’re being told to do! When the computer at the office doesn’t work, we’re told to “run it again” (i.e. to do the same thing over and over again until we get the different result of it working), or reboot it, and try exactly the same thing over and over again. In this sense, insanity has become a requirement of functioning in the modern (computational) world! 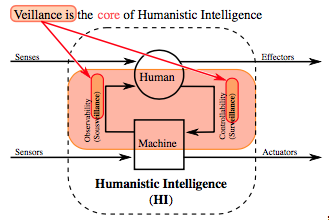 Perhaps the most radical idea we might proffer is that human intelligence be declared a disability in the world of machine intelligence. It is not so much that smart cities are making us stupid, but more likely that smart cities weed out human intelligence, or are unfriendly to it. Many highly intelligent people have difficulty using an API (Application Prisoner’s Interface) or SDK (System Detention Kit), i.e. super smart people often work better “close to the metal” at the lower level of assembly language and machine code than they do using high-level programming. In some sense, our modern world shuts these people out. To the extent that high degrees of human intelligence might be declared a disability, it might be possible to enforce accomodation. In this way, accessibility requirements could be set forth along the lines of free+open source computing as a social movement. To accomodate persons of various different abilities, it could be required that there be direct access (bypassing any proprietary SDK or API) to computing systems, such that we celebrate diversity. Persons with extreme intelligence might then no longer be marginalized outliers, but, rather, differently abled members of society who can be welcomed into the world of machine intelligence at whatever level they work best at. Such persons, who now represent a minority, might no longer be excluded from participation in many computational intelligence activities. Along with the prevalence of fake news, and fake reality, there is also a kind of witchcraft science, akin to Plato’s cave, in which people have come to accept a world they can’t understand. We’ve become acclimatized to closed-source secrecy, and might otherwise have entire cities a person can’t understand, no matter how intelligent they might be. We must not build smart cities that exclude smart people. Media must be directly accessible in the chosen format of the recipient, outside any browser, app, or viewer, for those who wish to construct their own way of seeing the computational world. The differently-abled, whether blind, partially sighted, or of an unusual intelligence (unusually high or unusually low) must be able to freely access content and participate in whatever way works best for them. Smart cities must accomodate smart cars. And smart cars must accomodate smart people. Not everyone wants a car with an “Idiot Light” (“Check Engine Light”). Some users actually want to understand their enginine or electric motor intimately, and should not be denied the capacity to understand the world in the way that works best for their differently abled mind. Some technology simply doesn’t belong in our smart world.